Metroline's route 16 had a mixed bag of vehicles allocated to it, and at one stage seemed to be getting a new batch of buses every year! 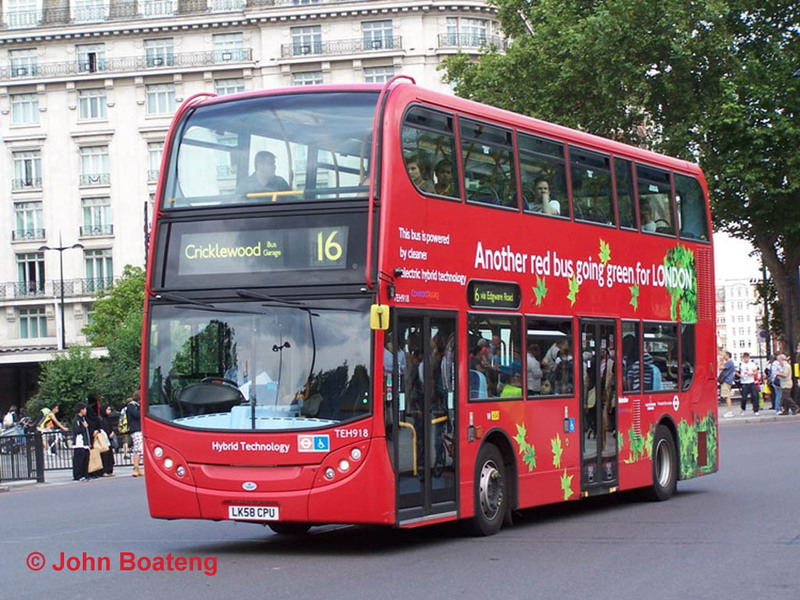 But in 2011 a batch of new hybrid Enviro400H double deckers was introduced. TEH1227 (LK61 BKG) represents the batch as it pulls into the first stop at Victoria on 11 April 2013. The first of the sequence of new buses to come were Volvo Olympians, as an upgrade from Metrobuses, in 1998. AV 23-38 later moved to the 260 and were replaced by an equal number of new Tridents. Those were the first of what was destined to be a short run of success with Metroline for Alexander, as opposed to the Plaxton President which had been specified before (though by MTL, before takeover by Metroline) and subsequently became standard. But in 2000 those were in turn cascaded, and replaced by the last Alexander bodied buses ordered by Metroline, TAL 118-134. This batch of TALs was thus unique. The TAs moved to route 32, but subsequently drifted back partly to cover an increase in service on the 16. The 16 also suffered the indignity of a large number of Dennis Dart single deckers around the turn of 2002/2003, to free up double deckers for the much needed conversion of routes 139 and 189 to double deck. A further frequency increase in 2006 meant that additional vehicles had to be drafted in to complement the TAL fleet, and these came in the form of TPL class President bodied long Tridents. Somewhat perversely, the frequency was fairly soon reduced again when route 332 was introduced. 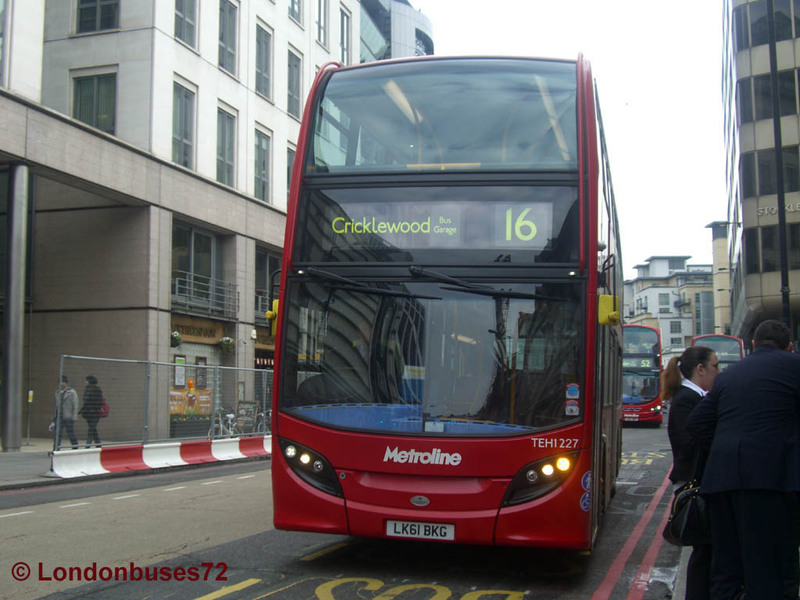 Although this does provide extra capacity between Cricklewood and Edgware Road, one would have assumed the busiest part of the 16 was to and from Victoria, which is the only unique section of the 16. 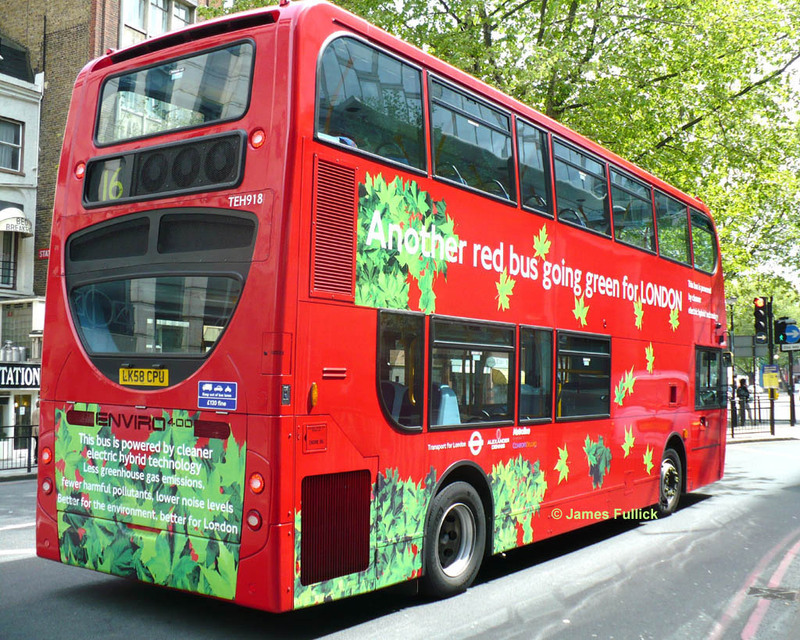 Cricklewood garage also received the first of the hybrid versions of the Enviro400 for Metroline, which were prainted in a special "green leaves" livery for hybrids when they were special, unlike the plain red of TEH1227 above. 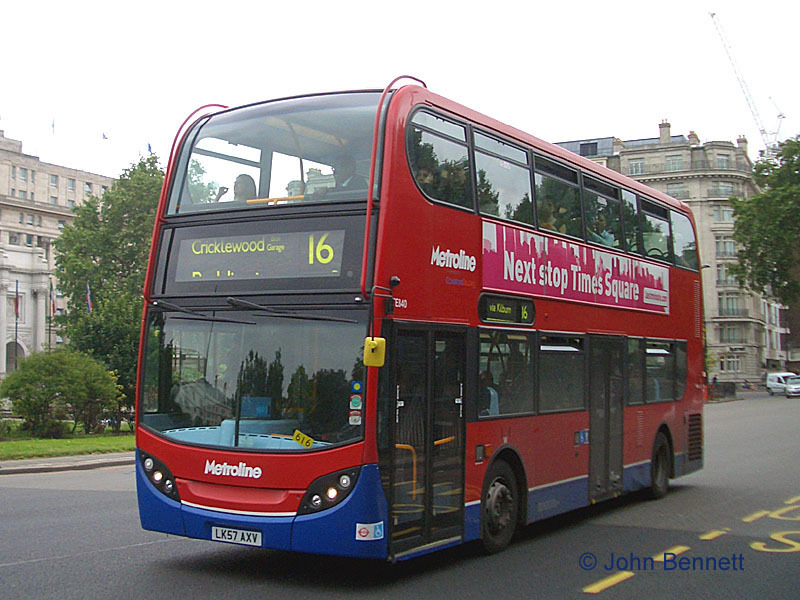 TEH918 (LK58 CPU) rounds Marble Arch on 8 August 2010, on its way back to its home garage, Cricklewood, where the 16 route now, once again, finishes. Surprisingly this was the extent of the route before the war. It was later extended to Sudbury via Neasden and North Wembley – even this is not as far as many routes from central London used to run – but has been progressively cut back again over the years. Neasden was the new terminus from 1970, a diversion of the 245 taking over to Neasden (and indeed leaving the 245 with very little of its previous route). The quieter, local, section between Cricklewood and Neasden was transferred to new route 316 in 1997 (later transferring to the new 332 route mentioned above), leaving the 16 to concentrate on the more high-profile job of transporting people to and from Victoria, its terminus throughout the period examined. We also have a rear view of the same bus, showing the bank of fans at the rear of the lower deck, where the batteries are located. Instead of driving the wheels directly, the engine charges the batteries, allowing the engine to operate more efficiently. Energy is also recovered during braking and also used to charge the batteries. Overall fuel consumption is reckoned to be down by about a third, seemingly despite the considerable weight of the batteries, which also has the downside of limiting the passenger carrying capacity of the vehicle.